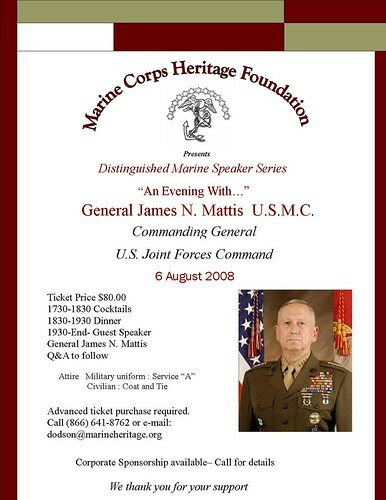 If you are in the Washington, DC area August 6 and would like to meet General Mattis, listen to him speak and get a chance to ask him a question, this is the event for you. It is a bit more expensive than past events. When I called to make my reservation, I called right after I got the flyer, they reminded me that this event was $80 and not the $40 that past events have been. I guess they are trying to gear this toward large donors, folks with deep pockets. Mattis, I would think, would be a great draw. Heck, he lead the first push into Fallujah, just wrapped up presiding over the Haditha trials, and now he'll be leading the JFC. He is also the General who uttered the famous quote, "If the Marines had wanted you to have a wife, they would have issued you one." His most recent famous quotes include the "No better friend, no worse enemy" and I think he told tribal leaders in Anbar if they F***ed with him and his Marines, he'd kill them all. They didn't list a speaking topic, so I have no clue what he'll be speaking about. He should be an interesting speaker, no matter what topic he speaks on. I wonder if I'd have the guts to ask him a question. Heck, I'm hoping I can make it. I'll have to leave early from work to attend. I have a training class that day and it went to 4 p.m. and that would be cutting it really short - - but at least I am the instructor, so I can control how long I talk about certain things. I have to sadly report to you that I had a break down at work yesterday. Two in fact. I had spent all weekend at work trying to get my tests completed. In 16 hours I had completed 8 tests and had only 3 more to go. Monday morning, the reviewer told me I had to do them all over again because I didn't get all of the screen shots the certifiers needed to see. I had to go down to the locker room and sit in a shower stall and cry. I cried for an hour. Then I came back up to work. I felt like the life had just been sucked out of me. Around 7 p.m. I had reached my breaking point both physically and mentally. I couldn't enter another thing but I had to get a bunch of stuff in before they backed up my testing region. I fat fingered something, it caused the transaction to blow-up, in effect and I had to start the set all over again. I yelled so loud at my computer that several co-workers ran over asking if I was o.k. and I REALLY yelled, "NO!" Which i think scared everyone because I'm pretty easy going. I apologized and then started to cry. I did finish what I needed to finish then went home to do - - laundry. I have no life. And that is all I have to say about that.